Rest day on the schedule today...sort of. Last night I decided to do my cross training so I did 10 miles on the bike and weights. It's been over a MONTH since I've done a workout besides running. Felt good. It was also nice to sleep in this morning too. First, a reminder to set your clocks forward one hour tonight before you go to bed. Yup. We lose an hour. Darn. Also a reminder that there are only 425 spots left for the Sham Rock N Roll Run 10k in Plymouth so hurry on over to sign up. Plenty of spots left for the 5k and 1 mile if you so choose to run that race. You only have until 3/14(Tuesday) to get in your registration(assuming spots are left) to guaranty yourself a shirt. Click HERE to sign up. One more week! I can't wait to blog about the fun! 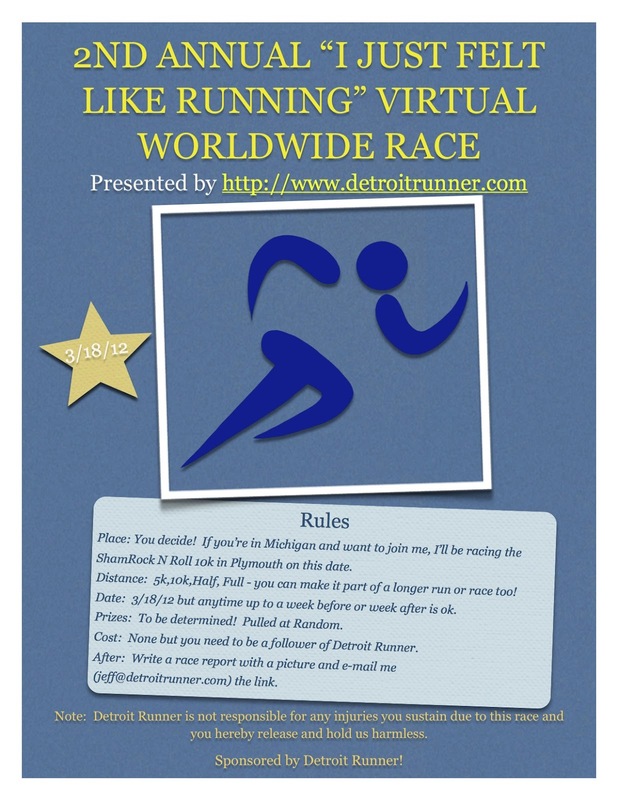 You can also still sign up for my virtual race. The 2nd annual "I just felt like Running!" 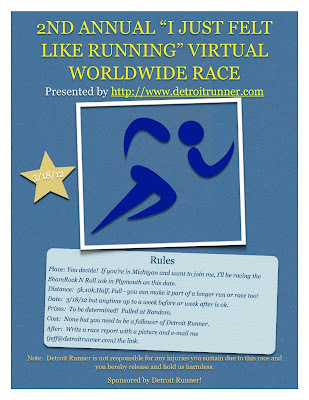 virtual race. Click HERE to sign up. We've got prizes from 1BandID and Headsweats to give out. Good luck!